The screening will be followed by a talk and Q&A with Andrew Lampert, an artist, archivist, and frequent writer on art and cinema. 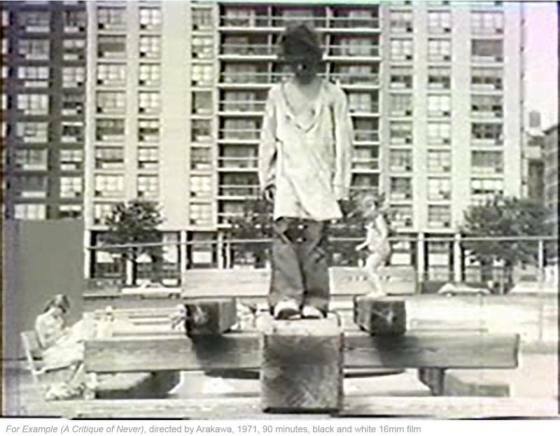 He will illuminate Arakawa’s film from the context of the late 1960s – 1970s experimental film scene. Andrew Lampert has created an eclectic and extensive body of films, videos, photographs and performances since the late 1990s. He exhibits regularly with past shows including: The Whitney Museum of American Art (2006 Whitney Biennial), The Getty Museum, The Solomon R. Guggenheim Museum, PS1/MoMA, The New York Film Festival, The Toronto Film Festival, The International Short Film Festival Oberhausen, and The International Film Festival Rotterdam among numerous international venues. He is currently the inaugural artist in the New York residency program of the Robert Rauschenberg Foundation. Lampert frequently writes on art and cinema, edited THE GEORGE KUCHAR READER (Primary Information, 2014), co-edited two volumes of HARRY SMITH COLLECTIONS CATALOGUE RAISONNE (J&L Books, 2015), co-edited MANUEL DELANDA: ISM ISM (J&L Books, 2018), and is co-editing a forthcoming volume of writings by Tony Conrad. As Archivist and Curator of Anthology Film Archives from 2002 – 2015 Lampert preserved hundreds of artist films and videos and co-programed public screenings. He teaches at The Cooper Union and CUNY City College, is one half of the creative firm Chen & Lampert, and his videos are distributed by Electronic Arts Intermix. The Emily Harvey Foundation (EHF), operating between New York and Venice, is a not-for-profit organization created in 2004. At its New York base, the EHF has developed an ambitious contemporary art program focused through the intellectual scope of its archives and the principle postwar projects represented in its art collection: Mail Art, Fluxus, Concept Art, Early Video, and Performance Art. In Venice, the EHF comprises a residency program open to artists, art historians, curators, and other creative thinkers, working at the forefront of their disciplines and seeking positive change. Our primary concern is to give voice, and momentary material form, to new research, and to discursive and process-based practices but not necessary art in its more commercial, traditional manifestations. That much of what we do would be impossible, and unfeasible, at almost any other institution, is a major impetus for us to continue. Our aim is to nurture collaborative and cross-disciplinary approaches, while generating alternatives to more established practices and formats in contemporary art.